Welcome to GT Raceway Perth, the "Scalextric" hire company. GT Raceway Perth has the latest digital technology "Scalextric" set up for hours of fun. Perfect for any party whether it's for kids or adults. Celebrate your next birthday party, work-do or fun night in by bringing the thrill of a GT Raceway track to you! We have full packages to suit. Thanks from GT Raceway Perth. Stay up to date with all our latest information, including offers, competitions and much more by hitting the like button on our Facebook page. Here you will find GT Raceway Perth's Events page where you can come and see what we have to offer, ask some questions or just come for a blast on the GT Raceway track! Why have Scalextric Slot cars for your next party or event? Well, It’s the perfect complement to various types of events, including children’s birthday parties, adult parties, weddings, school fairs and festivals, kids birthday parties, bucks night, fundraiser, family get-together's, the list is endless. The Slot Car Race Track known as the GT Raceway is 15 metres in length from start to finish with plenty of twists and turns. Running over two levels, the racers have the ability to change lanes for maximum “race like” interaction. We also have a pit lane for the advanced racers out there and a race screen to track all the times and most importantly, who’s winning! Setup of the Slot car race track is simple. Only requiring a 3 x 3-metre space, we can have it up and running in minutes. We provide all the equipment required including tables, power chords, race screen etc. 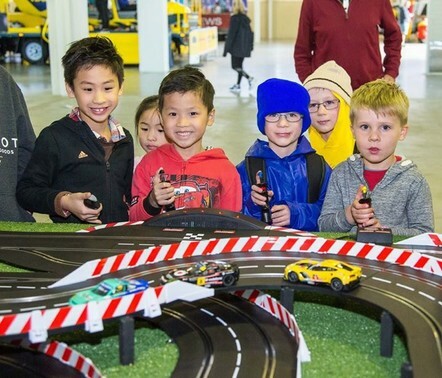 Having a Slot car race track for parties is an alternative option to the norm like a bouncy castle, but it requires less space and best of all can it be utilized indoors or for outdoor events, the choice is yours! No access to power? No problem! We can run the slot car race track from a silent power source if required. Outdoor event? No problem! We have our very own branded marquee for the “professional” look but more importantly, it offers that flexibility you require. Having GT Raceway for hosting your guests is a stress-free process from start to finish. For Scalextric Party hire in Perth, GT Raceway is second to none. We can provide the ultimate race like experience like no other. Scalextric Slot car racing offers something different. Quite often parents or even grandparents say they feel nostalgic, bringing back so many childhood memories. It’s often the mum's or dad's have a go and before you know it the younger generation grab controllers and start racing! With the cars flying around and the cheering and heckling going on around the table, the atmosphere is electric. GT Raceway is a locally owned, family run business that caters to all kinds of occasions, whether it's a birthday party, corporate function, work do or just a fun night in. We are the "Scalextric" Party hire company, offering a realistic and exhilarating racing experience for all!